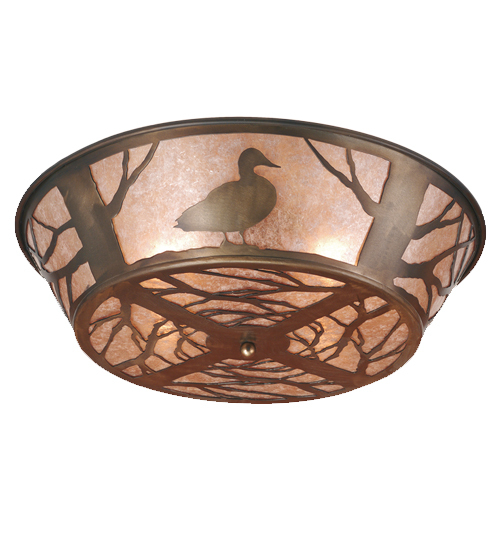 Description: THE MAJESTIC NORTH WOODS DUCK ADORNS THIS RUSTIC FLUSH MOUNT CEILING FIXTURE. HAND MADE IN THE USA, MEYDA TIFFANY CRAFTSMAN HAVE FINISHED THIS FIXTURE IN ANTIQUE COPPER. CROSSBAR AND HARDWARE FOR MOUNTING INCLUDED.